Find gold in the desert. The success of Desert Challenge Games is due in large part to our generous sponsors that support our mission to provide sports and recreation opportunities to individuals with disabilities. We thank all of the sponsors below for their contributions that have given athletes from across the world the ability to compete in the Desert Challenge Games. Desert Challenge Games began in the early 1980’s with a small group of track athletes from AzDS competing against track athletes from Tucson, AZ. In 1990, Desert Challenge Games grew to include swimming and weightlifting. In 1991, Desert Challenge was held at Arizona State University and was the Far West Regional qualifying event. Desert Challenge competition grew again to include Archery, Table Tennis and Rifle Shoot. In 1997, 2004 and 2012, the Desert Challenge organizing committee hosted Junior Nationals. The Desert Challenge organizing committee also hosted the 2008 Paralympic Track and Field Trials. The host organization of the Desert Challenge Games is Arizona Disabled Sports (AzDS). AzDS is the leading organization in Arizona that provides athletic opportunities for individuals with all types of disability. There are approximately 1,200 athletes as young as six years old living throughout Arizona participating in 30 adaptive programs hosted by AzDS. The Desert Challenge Games were awarded the Outstanding Adaptive Program by the Arizona Parks & Recreation Association in 2013. When registering, please note that the only athletics events offered are the events of Tokyo 2020. No other events will be offered for adults other than the Tokyo 2020 Program. Certain events are only offered for one gender or for certain classifications within a gender. If you are not classified yet, please make your best guess by using this information HERE. The toddler run is for kids ages 3-5 with a physical, visual or intellectual impairment. This event is free of charge and will take place Friday, May 24th at 4:50pm to kick off the Desert Challenge Games. Please complete the registration form below and email it to dcgames@arizonadisabledsports.com. Every athlete, guide runner and coach must and complete the event waiver. Please download, print, and bring your completed waiver with you to Registrant Check-In. For additional information please contact the Event Director at DCGames@arizonadisabledsports.com. All athletes that compete at the Desert Challenge Games who have an IPC license and have a New, Review or Review 2019 classification status must undergo international classification evaluation at Desert Challenge Games. To be eligible to receive an international classification evaluation appointment athletes must have a 2019 IPC license including submission of medical forms, supporting documents and must be registered for Desert Challenge Games prior to April 28th, 2019. Athletes who are licensed can check their classification status HERE. To obtain an IPC license athletes can view requirements HERE. All U.S. citizens: if you have questions regarding licensing and classification please contact Bryce Boarman at Bryce.Boarman@usoc.org or 719-866-4240. you are not a U.S. citizen you must contact your National Paralympic Committee (NPC) for classification and licensing questions. Desert Challenge Games will host classification for physical impairments (May 21-23), visually impaired athletes (May 22-23) and intellectually impaired athletes (May 22-23) beginning at 9:00am each day. The classification schedule will be available approximately 2 weeks prior to competition. Athlete date/time request CANNOT be guaranteed and athletes are expected to be available for the full classification period beginning May 21st at 9:00am for PI athletes and May 22nd at 9:00am for VI and II athletes. All U.S. athletes with an intellectual disability must first contact Athletes Without Limits before they can obtain an IPC license and receive a classification evaluation. Click HERE for eligibility and application information. Please note: As part of the World Para Athletics Grand Prix, all athletes ages 14 and older that are interested in competing with the World Para Athletics Grand Prix MUST have an IPC license. All athletes that do not have an IPC license and have never been nationally classified, have a National Provisional (NP), National Review (NR) or NR 2019 status must go through national classification at Desert Challenge Games. National classification will be offered for track and field and archery. To review national classification status in our national classification database for track and field click HERE. All athletes that go through national classification must complete a national medical diagnostics form that can be found HERE. The national forms do not need to be filled out by a doctor and should be submitted to Bryce.boarman@usoc.org no later than April 28th, 2019. All athletes with a visual impairment who need a national classification must submit their medical forms to Bryce Boarman at Bryce.Boarman@usoc.org by April 28th, 2019 to receive their national classification. The VI medical form can be found HERE. Athletes with an intellectual impairment competing in swimming or track and field at Desert Challenge Games must contact Athletes Without Limits to apply for eligibility to obtain their national classification. Click HERE for eligibility and application information. Bryce Boarman is the USOC representative responsible for World Para Athletics licensure and classification. All Medical Diagnostics forms for U.S. athletes must be turned in to Bryce Boarman by April 28th, 2019. Bryce.Boarman@usoc.org. International athletes must contact their National Paralympic Committee (NPC) to find the appropriate contact for submitting the Medical Diagnostic forms. US Athletes can find additional information at US Paralympics website HERE. US and International athletes can verify their classification and/or classification status on the MASTERLIST provided on the World Para Athletics web site. The Desert Challenge Games would not be possible without the support of those that value the importance of sports inclusion. 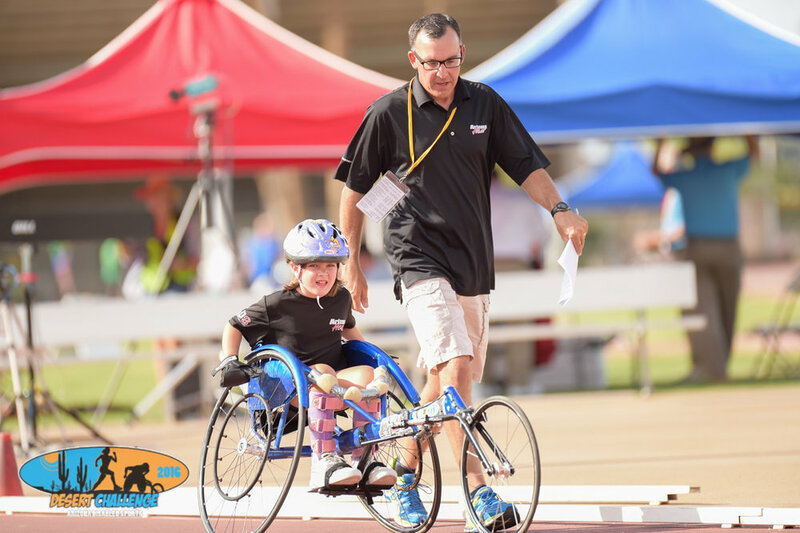 By becoming a sponsor, you are providing an opportunity for youth, adult and veteran athletes with disabilities from across the world to compete with the hopes of qualifying for the Adaptive Sports USA Junior Nationals, Adult National Championships, or US Veteran Games. Banner opportunity throughout the Desert Challenge Games, provided by the Local Organizing Committee. Speaker opportunity at opening ceremony. Recognition by event director at all Desert Challenge Games events. Logo and web link on event website. Full page program advertisement in event program. 10 X 20 booth at athletics events. Logo representation on medals and event shirt - representative may also assist with awards. Sponsor recognition in quarterly Arizona Disabled Sports e-newsletter. Opportunity for sponsor staff and family members to serve as volunteers for an event of choice. Recognition on social media sites. Sponsor recognition in Annual Report. Sponsor gift to recognize support. Banner opportunity through the Desert Challenge Games, provided by the Local Organizing Committee. Recognition by event director at all Desert Challenge Games events. Logo and web link on event website. Half page advertisement in event program. 10 X 20 booth at athletics events. Logo representation on event shirt. Sponsor recognition in quarterly Arizona Disabled Sports e-newsletter. Opportunity for sponsor staff and family members to serve as volunteers for an event of choice. Recognition on social media sites. Sponsor recognition in Annual Report. Sponsor gift to recognize support. Banner opportunity throughout the Desert Challenge Games, provided by the Local Organizing Committee. Logo and web link on event website. Quarter page advertisement in event program. 10 X 10 booth at athletics events. Logo representation on event shirt. Sponsor recognition in quarterly Arizona Disabled Sports e-newsletter. Opportunity for sponsor staff and family members to serve as volunteers for an event of choice. Recognition on social media sites. Sponsor recognition in Annual Report. Sponsor gift to recognize support. Banner opportunity throughout Desert Challenge Games, provided by the Local Organizing Committee. Logo and web link on event website. Logo in event program. 10 X 10 booth at athletics events. Sponsor recognition in quarterly Arizona Disabled sports e-newsletter. Recognition on social media sites. Sponsor recognition in Annual Report. Sponsor gift to recognize support. Logo and web link on event website. Logo in event program. 10 X 10 booth at Track & Field events. Sponsor recognition in quarterly Arizona Disabled Sports e-newsletter. Recognition on social media sites. Sponsor recognition in Annual Report. 10 X 10 booth at Track & Field events. Name in event program. Recognition on social media sites. Click HERE to view the full Sponsorship Packet. Sponsorship commitment must be made prior to Friday, April 19th, 2019 for guaranteed representation in marketing materials. Arizona Disabled Sports needs approximately 375 volunteers for the annual Desert Challenge Games as well as the group of approximately 20 dedicated committee members. We encourage individuals and groups to sign-up to volunteer. General Volunteers: There will be volunteer opportunities from Tuesday, May 22nd through Sunday, May 26th, 2019. Please use the button below to be directed to Sign-up Genius, which lists general volunteer responsibilities and the needed time slots. More specific information about your volunteer experience can be found HERE. Photographer Volunteers: If you are an individual with expertise in taking action photos, please consider donating your time by using the Sign-up Genius button below for specific photographer volunteer needs. Please click on the links below to view the room blocks we have available. Hilton Garden Inn and Homewood Suites are directly next to each other and will be the host of classification appointments. The Hyatt Place is also available and will be used as our overflow hotel. Please click on the pinned locations on the map to the right to see event venues and hotels. To book a room at the Hilton Garden Inn, please click HERE. To book a room at Homewood Suites, please click HERE. To book a room at the Hyatt Place, please click HERE.